Connect with the Angels instantly with your own Angel Guidance Pouch! ~ Do you need guidance? ~ Are you unclear about a situation? ~ Are you looking for an inspirational gift? You can access the heavenly guidance of the Angels, anytime, by working with your own Angel Guidance Pouch! The Angel Guidance Pouch is easy-to-use and small enough to carry with you anywhere. All you have to do is close your eyes, ask the Angels your question and then choose a reply from the pouch. 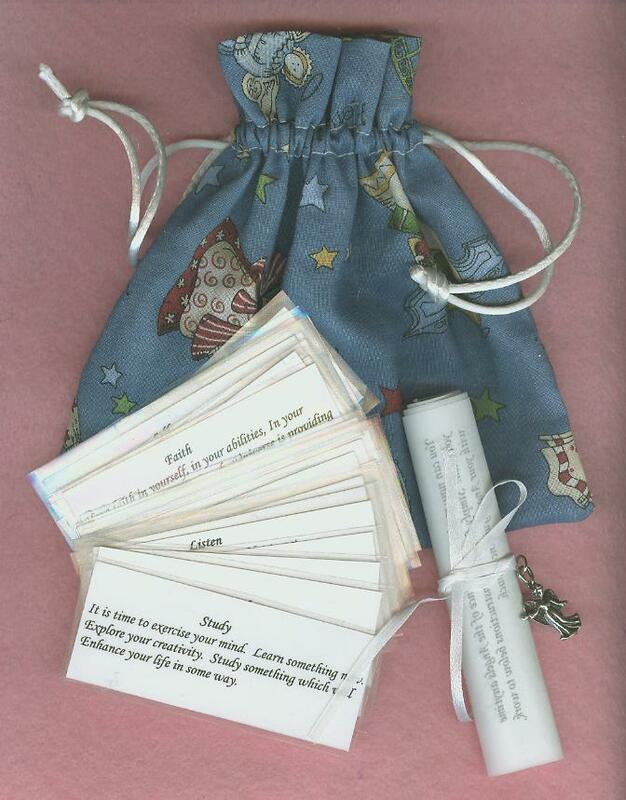 The message that you draw from the pouch will be the Angels' response to your question. During meditation and connection with the Angels, seamstress and Angel worker Carol S. was guided to create these beautiful Angel Guidance Pouches. The Angels have given Their advice and inspiration throughout the entire process of creating this special tool for guidance. 33 Guidance Messages, each containing a Keyword and a small message from the Angels. A scroll containing easy, complete instructions for using your Angel Guidance Pouch. To order your own Angel Guidance Pouch (or one for a friend), simply click on the "BUY NOW" button below and you will be taken to a secure PayPal site to make your payment by credit card. Once your payment is made, you will receive a confirmation email requesting your shipping information. You will receive your Angel Guidance Pouch within 7-10 business days. Questions? Contact Carol directly by clicking here.